I’ve had the opportunity to sing behind Ann Mortifee before. It was at an earth Day rally. It is always exhilarating singing with the Gettin’ Higher Choir, but when we sing behind a headliner like Ann it gets even better. I’m sure she will astound us yet again as she has such depth in her voice. I first heard Ann at her first professional engagement at the Bunkhouse in Vancouver in 1965. I have enjoyed many of concerts, one woman shows and musical plays since. One of the great benefits I have gained from singing with the Gettin’ Higher Choir has been the honour and pleasure of being one of her 200 back-up singers in some of our past concerts. I am seriously looking forward to doing that again in these concerts. I have been an Ann Mortifee fan since the early ’70s and I’m really excited at the opportunity to be one of her “back-up singers” at our concert. 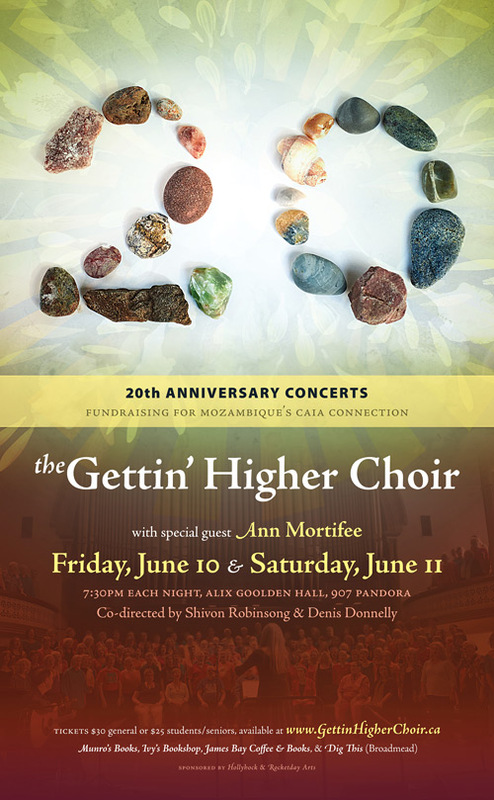 This is my 3rd season singing with the Gettin’ Higher Choir and I’m also really excited at the opportunity to sing in the choir’s 20’th anniversary concerts – singing all of the best songs from the past 20 years will make these concerts a truly memorable experience! 20 years of singing! Amazing, I just wish I had found The Gettin Higher Choir 8 years ago when I arrived in Canada instead of only 4 years ago. Can’t wait to be part of this amazing concert! Ann Mortifee first caught my interest in the 60’s at BCIT concerts. I’ve been to many of her performances and book launches. She is truly inspiring. Her connection to Africa is very fitting with our concert supporting the Caia project in Mozambique. I really anticipate a great experience singing with Ann. We offer up our black,bright and best. Thanks, Janet, for your poem every word rings true! I am so happy that I was able to sit in the audience for the Friday performance. I was still deeply disappointed about not singing but I learned something that I think is important to pass along. I now think that every choir member should experience being in the audience once during their first year or maybe two with the choir. Singing on stage is a wonderful and enriching experience but to sit and hear the result of all those practice times is every bit as important. From practices and on stage you get only a partial idea of the magnificence of such a large assembled choir and the sound produced. Despite being in the Christmas concert I was wonderfully surprised to hear the songs I had worked on and enjoyed them in a new way. The songs were so much better than our best Tuesday practices. The music so full and rich. The faces all full of the joy of singing and of the songs. Somehow I was in the right place at the right time to get a true and accurate appreciation of what all our efforts produce. Friday’s performance was awesome, powerful, inspiring, moving and touched the whole person in body, heart and spirit. As a member of the Bass section I was aware of the potential weak spots but I could hear none of them as it was all just as we had worked to make it beautiful. An evening of beauty to the human spirit communicated through the medium of choral music. Thanks to all who gave of themselves to make this possible. It wasn’t just a concert, it was a celebration. I’ve been singing in the choir for the last three years after a career of non singing. It is refreshing, liberating and and balancing. So many thanks to Shivon, Denis, Gloria and Bill for their hours upon hours of dedication to making it such an enriching experience and to the choir for making it such a joyous community. As always this concert was an inspirational, fun, community building experience. In the past 4 years of being part of this amazing group of singers has brought me lots ofnew frends, many new songs to love, and the concept of Ubuntu. Thank you Denis & Shivon (and Bill & Gloria) for all you do both in front and behind the scenes. Thank you Ann and your musicians for showing us all, both GHC and audience an amazing time! It was a pleasure to perform with you. I can’t wait to see you all in September. Love you all. Words cannot express what I experienced this weekend as it was far too profound. Joining the choir has been one of the greatest things I’ve ever done and singing in the performances this weekend has one of the most incredible experiences of my life. This was my fourth performance and everyone of them have been absolutely amazing. The powerful feelings that come over me being part of something so big where taken to a whole new level this time. I have recently completed a degree in biology and, with so much cerebral focus, I feel that I have lost touch with my spirit. As a result of the weekend’s experience, my spirit has been awakened in full force. I believe that singing is one of the most valuable parts of living and I’ve always been saddened by the fact that our culture has lost this in a big way. I feel it is so unbelievable that singing and playing instruments are often reserved for a select few and many people feeling that they lack the skill. I believe we, as all other animals with vocal capacity, have evolved to use our voices and use them to their full capacity which most people in our society rarely do but most traditional cultures do everyday. There has only been one problem for me in joining the choir, singing by myself has become a bit lonely ??? ?, But it’s more than worth it. Well, thank you all for being part of this amazing experience for me. Thank you, Ann Mortifee, for sharing your powerful message, for your incredible voice, and for your open heart! Singing with you was almost a spiritual experience! ‘Something in Me’ moved me to tears!! Thank you to Shivon for her youthful spirit, her vision and her steadyfast guidance through the songs! When I am on stage and look at you I feel at peace!! Thank you to Denis for his beautiful arrangement! Your talent and love for the fine arts inspires us all!! I just need to say a huge “thank you! !” to both Shivon and Denis for all your musical genius, inspiration, support and hard work in bringing us to a place where we can ‘sing our hearts out’ and truly get high on the experience. Also a big thanks to Bill & Gloria for supporting and organizing the choir as you do – we couldn’t do it without you! Already looking forward to September! Thank you for my inner peace and joy. May the joy of our music carry you until we sing again. I joined the choir in February. The concerts were absolute joy! I owe a huge thank you to Frances, my ‘mentor’. i literally hung on every word she sang and she led me through. Thank you to Shivon and Dennis, I feel I have learned so much in just a few months and have found my voice after so many years. Thanks to Gloria and to Bill for the excellent organization. Thank you to Cathy, Cherry and Agnes, my Victoria Evening Newcomer buddies. They encouraged me to join and made me feel very welcome. Without question, I’ll be signing up again in September! Thank you all so much, especially our leaders, for creating a community where we can share the joy of singing. I am queen of unauthorized harmonies but learning a lot on music reading and from standing beside people who sing alto. Two very enjoyable concerts and what a joyful experience singing with Ann. Thank you Denis and Shivon for your guidance and thank the choir for their passion. I’ve sung How We Love and The Song Will Never End before but now they have a deeper meaning. “What a joy to hear the human voice expressing a spiritual tone for a change. A concert with a side benefit …. I thought choir members might enjoy this piece of serendipity …. This morning at worked the phone rang, and when I answered, a rather tentative voice asked if I was the Barb McLintock who sang with the Gettin’ Higher Choir. I agreed it was, and she asked, still tentative, had I grown up in Winnipeg? Indeed I had. It turned out to be a friend I went to junior high school with (Viscount Alexander School, Fort Garry, Manitoba) whom I had quite lost touch with. We figured it was 50 years since we had lost spoken after we ended up going on to different high schools. She still lives in Winnipeg but was out in Victoria for a few days visiting her sister and they had come to the concert on Friday, and seen my name on the program! Through her I have re-connected with a whole group of friends from that time in my life. What an added bonus to what has to have been the most amazing concerts ever!! Thank you again Shivon and Denis for letting us experience our singing birthright so marvellously.